If you are looking to buy your first proper mountain bike then £500 is a popular price point. At £500 a mountain bike should be capable of serious off-road use. If you want to enter your first race, visit trail centres or just explore your local tracks these bikes will be capable of it. Most of them will also be versatile enough to use for commuting and other general riding. Wheel size is a big choice in mountain bikes at any price point. Nearly all adult mountain bikes being made at the moment will have 27.5” wheels or 29” wheels. Typically 27.5” wheels are seen as being better for technical off-road use where you will be riding on lots of tight trails with sharp corners and lots of rocks and routes. The basic idea being that the 27.5” wheel is more manoeuvrable (it will also be easier to pop a wheelie or do other tricks). A 29” wheel bike will normally be faster as the bike will ‘roll’ more easily once you are up to speed. Nearly all race bikes will have 29” wheels. If you plan on using your bike for commuting then a 29” wheel bike will get you to work quicker. Some manufacturers, including Trek, use a variation on ‘smart sizing’. They will use a 27.5” wheel on smaller framed bikes (13” and 15”) and then switch to 29” wheels on medium and large bikes. Trek have massively upgraded their Marlin mountain bikes for 2019. They are using the frame from their 2018 X-Caliber bikes (which sell for up to £1000) for the 2019 Marlin so the first thing you are getting with a 2019 Marlin is a super high quality frame at an absolutely bargain price. Trek have then added some great components including hydraulic brakes, Suntour suspension forks and 24 speed Shimano gears. Just the saddle on the Marlin 6 sells for £50 on its own. So although this is a ‘budget’ bike it is one where you are getting a top quality piece of kit. 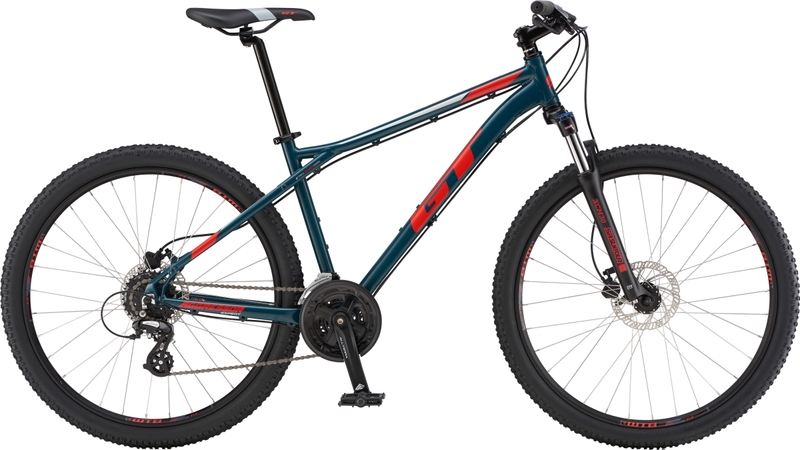 Trek are using their Smart Sizing on the Marlin, so smaller frames use the 27.5” wheel and the larger frames use a 29”. Although setup as a serious off-road bike the Marlin also comes with the mounts you need for mudguards and racks if you want to do some commuting or touring. The 2019 Marlin 6 is available in both men’s and women’s versions. The men’s bike comes in red or black and the women’s bike is ‘Miami blue’. The 2019 Specialized Pitch Sport is a ‘carry over model’, so it’s exactly the same bike as the 2018 version. That’s not a bad thing as it was by far the best bike in its price range in 2018 and one of our best-selling bikes as a company. One of the things that made this bike so popular is that the geometry and sizing are really spot on for new mountain bikers making a bike that is easy to handle but still fun to ride. Like the Trek Marlin it comes in men’s and women’s versions and is available in a couple of different colours. Unlike the Marlin, the Specialized Pitch Sport uses 27.5” wheels on all frame sizes. 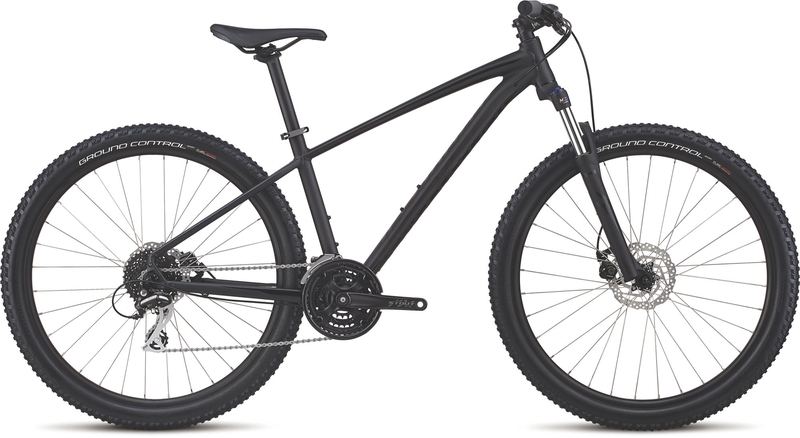 Specialized argue that this makes the bikes more stable and confidence inspiring when being used off-road so it’s a better choice if you are planning to do lots of hard off-road rides. While a lot of the specifications on the Specialized Pitch are similar to the Trek Marlin the big difference is that is comes with mechanical disc brakes rather than hydraulic ones. This will make the bike easier to maintain and the brakes will be fine for most use but they won’t be quite as good when used off-road. Cannondale did not have any mountain bikes under £500 in 2018. To fill that gap they have introduced the Trail 7 for 2019. Cannondale like to do things a little differently from other bike brands so there are some extra little touches on this bike. It comes with wider boost wheels (which makes the wheels stiffer and better handling), slack geometry for more stability and wider handlebars, shorter stems and shorter chain stays for quicker handling. These are all little touches that make the Trail 7 handle like a much more expensive bike. The Trail 7 comes with a Suntour suspension fork and hydraulic disc brakes and, unlike the Pitch and Marlin, has a double chainset. The standard mountain bike setup always used to be 3 chainrings at the front of the bike. In recent years most bikes have switched to single or double chainrings. The Trail 7 has followed this trend whereas Specialized and Trek have gone down the more traditional route. This does mean you will lose some top end speed on the road but it is another indication that Cannondale have set the Trail 7 up as a proper off-road machine. Like the Trek the Cannondale Trail 7 uses 27.5” wheels on the smaller size bikes and the moves up to 29” wheels on the larger bikes. The Cannondale Trail 7 only comes as a men’s bike but there is a women’s bike at the same price. 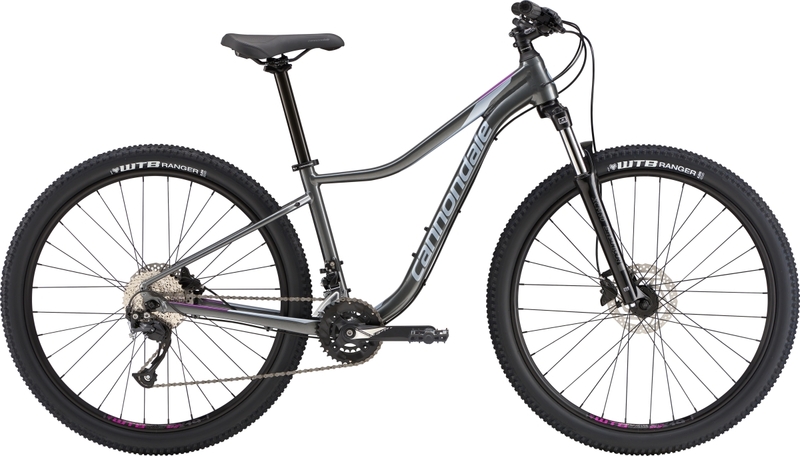 The Trail 4 is Cannondale’s entry level women’s mountain bike. It shares many of the same characteristic as the men’s Trail 7 including proper off-road geometry, hydraulic disc brakes, boost wheels and a double chainset. It does use a slightly different frame design with a dropped top tube and also only comes in the 27.5” wheel size. The GT Aggressor Expert was one of our best selling bikes in any category in 2018 and is a great option for a first mountain bike. The Aggressor Expert is great all-round bike for use around town, on cycle paths and for off-road riding. It’s not quite as capable off-road as the Marlin or the Trail but it can handle regular off-road use. If you are looking for a budget bike to get you started this is a great option. The 2019 GT Aggressor Expert comes with a great specification for the price. Like the Specialized and the Trek it uses a triple chainring at the front giving 24 gears. It also comes with hydraulic brakes, something you don’t get on the Specialized Pitch which is £70 more. It does only come with an 80mm travel suspension fork on the front though, rather than 100mm on the other bikes we have looked it. This gives you slightly less suspension to soak up the bumps off-road. The GT Aggressor Expert just comes in a 27.5” wheel and there is no women’s version of the bike.